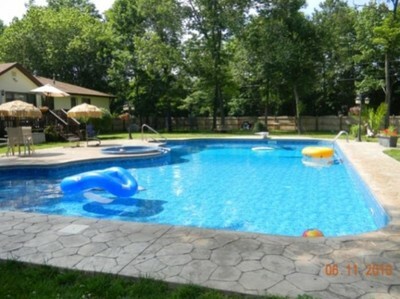 In need of Pool Service in Jackson, New Jersey? Swimming pools represent a major investment, and wise Jackson pool owners prefer the experts at Lester Pools Inc. do the hard work of maintaining their pool so it can be enjoyed anytime. Lester Pools Inc. remains above the competition, working with residential and commercial clients in Jackson since 2007. Our top notch service and friendly staff help you enjoy and protect your investment in recreation and fitness. Lester Pools Inc. offers affordable pool service. From pool leak repairs to chemical testing, hot tub maintenance and regular swimming pool cleaning, our staff does the job right and for a fair price. Our prices always remain competitive, and we strive to offer superior service at every visit. Enjoy your Jackson pool without breaking the budget or your back by letting Lester Pools Inc. take care of your pool service needs. Our highly trained staff can spot potential problems with your Jackson swimming pool, and our broad list of regular local customers allows us to stay ahead of regional issues that may affect your pool. Storms, drought and other climate conditions could alter your chemical use, increase pest or organic problems and interrupt your swim schedule. Let Lester Pools Inc. use our trained staff and local experience to offer you the best pool service in Jackson, NJ. Lester Pools Inc. uses only the most dependable equipment on your Jackson swimming pool. Combining technology with good, old fashioned hard work, our staff provide pool service services for countless clients in NJ. Reliable equipment helps us to stay on schedule, fulfilling our obligation to our customers and tackling any major pool repairs that arise in Jackson. For affordable, dependable pool service in Jackson, NJ, Lester Pools Inc. is the swimming pool specialist to call. Our local experience is ready to provide you with peace of mind and help you to enjoy every minute of your pool this year, and for many years to come. Call (732) 201-4521 for a free, no-obligation quote on your pool service needs. 5★★★★★ - "Lester gave me a quote that was way below what I thought it would take to replace my liner. He drained the pool, measured, and the liner came in 2 weeks. It took him and two workers about two and a half hours to install it. They did a perfect job! I also had my filter and pump replaced by Lester. I would highly recommend them for all of your pool services." 5★★★★★ - "Phenomenal! Lester was great to work with! I needed my liner changed and Lester and his son got the job completed in less then a day! I would recommend them to everyone I know. Thanks for the help, Lester Pools!" 5★★★★★ - "I am having a great experience with Lester--they have been prompt and gave a good price on a new inground liner--the job was done quicker than any other company I checked with--Gustavo was the installer who worked extremely hard --he was courteous and knowledgeable--the pool is filling with water now'- I will follow up with a final statement when they come to open and complete the job"
5★★★★★ - "Hi--I needed a liner for my inground Grecian pool-- I called several places and it was going to take at least 4 weeks to get anything done--Lester Pools got the liner and was at my pool to install in 10 days--Elizabeth at the office is very nice and attentive--my installer, Gustavo, worked very hard all day long and the liner looks great so far--he is coming back tomorrow to finish up and open pool--i will update my review when the job is complete....."
I had to change my liner and they were great - changed it in 1 day. If you need your pool opened or a new pool installed, I definitely recommend." 5★★★★★ - "Lester and his team were friendly, on time, affordable, professional, and fast! They cleaned the cover and water bags, folded everything so nicely and were even able to fix a cracked pvc pipe to our filter that we weren't aware of right then and there! I highly recommend them, especially after comparing them to other local pool service companies in the area, they rocked it! Thank you Lester and team!" ★★★★★ - "Hi my name is IMDb.me/ChrisVictor from the Blockbuster Hit coming to a Theatre Near You on May 20th 2016 as well as on Video On Demand too ! I highly Recommend Lester Pool's for all your Pool Care Needs !" ★★★★★ - "I recently had the good fortune of finding Lester of Lester Pools Inc. Upon turning on my pool pump, water gushed everywhere since a pvc union from the filter had cracked. I called Lester Pools and they came out the same day. Lester and his son had the job completed in 15 minutes and at a very reasonable price. I will be calling them in the future for any of my pool needs ! Lester (who looks like George Washington) knows what service is about."